I am restoring a 68 SS that sat in a garage for 42 years on the east coast and most all of the nuts & bolts are in very bad shape (un-restorable). Can anyone out there tell me where a good source of used or restored original hardware is. Or if anyone has a bucket full of original stuff they want to get rid of please let me know. I have look at some items from AMK but the heads patterns are not correct in some cases. The reason I am so concerned of the originality is that this car only has 9977 original miles on it. IMHO AMK fasteners has the best reproduction hardware sets out there. Here is the 68 GM catalog broken down in PDF format. Try soaking all your original hardware in Evaporust. You'll be surprised how well that stuff works. '67 SS/RS 350, Muncie M20, Black with black interior. A guy on E-Bay sells original hardware. His ebay name is originalcorvette. He also sells on the yenko.net site. Dan do some searches as there is much to review. Check my build thread as I have a lot of info there as well on hardware but let me start with a few lessons learned. Good advice as without a doubt AMK is where restorers obtain most of their hardware (screws, bolts, etc.) needs, and Evapo-Rust IMHO needs to be in anyone's garage who is doing any type of restoration but in many cases original hardware is pitted and sometimes the mfg. markings are destroyed. I saved what I deemed needed saved and then re-phosphate which is a fairly simple process. If you were just addressing a 9977 mile car by taking out a bolt, putting in evapo-rust, and then coating with rust prevention magic to protect for its longevity that is one thing but you stated "restore". A large % of AMK's hardware has the correct configuration and in many cases even one of the many suppliers used back then as many were used so maybe your comment concerning head patterns means suppliers. The main goal is to have the correct configuration and what AMK does as well is gives you a guide as the back of their catalog (another thing every garage needs to have) has a listing of GM hardware by part number which assists with what did a certain screw or bolt configuration have. During our 68Z restoration (still going on) I spent hours going thru the AIM and AMK catalog along with reviewing our hardware off our car and other survivors. Not everything is correct from AMK or suited my fancy but I'd tell anyone to purchase the kits as it will save you a lot of time and again many of the pieces are exactly what I had in our 68. Here is a list that I think will help you so good luck on your project. Note the page number is the page from the AIM. 3839741-P135/142 3/8-16X1 3/8 1.31 Conical AMK B-11964 (4) Head Marking circled E? 3846202-Pages 61/63/73/144/145 5/16-18X7/8 .75 Conical AMK 'E', B-13317 (6) & B-10876 (12) & 'C' type B-11709 (6) & B-11710 (12) Note: Both head marks acceptable. 3922549-P360 5/16-18X7/8 1/2AF .55 split AMK B10913 (2) see 9409098 for alt. 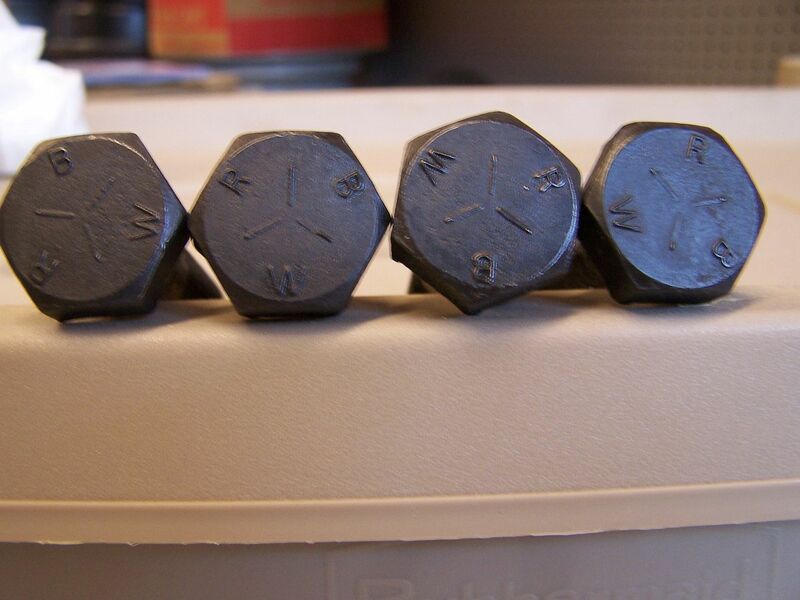 9421479 P37 Zinc-Cowl Panel Screw 8-18X9/16 1/4 AF .62 Flat AMK B-12172 (4) Our originals were phosphate, but not the norm. 9422245-P45 Listed under AMK but not on page shown??? 9780422-Pages 137/141-145, 149, 153 5/16-18X3/4 .67OD AMK 'anchor' B-13306 (12) B-13307 (50) Heavy use-fender, header, valance, batt. tray, hood catch, etc..
0125912-P73 Brake Line AMK B-10301 (4) cad. I have read your post (well, most of it) and will do so again. I have 5 gal of Evapo-rust in my shop, so I am good there. Your detail of everything you have done including the listing you have shared in your reply is very much appreciated. I will take your advice and start my homework on the AMK products. This car had to be completely dis-assembled due to it being in a cinder block building in the woods of west Virginia sweating for those 42 years. The only saving grace with this car is when the prior (original) owner parked it he put 7 gal (yes, 7 gals) of oil in the motor, the only internal part that rusted was the top of the push rods. Thank you for sharing, Chick, nice list. We shall see if we can make it a sticky here for other members' future reference. Dan, our 68Z came out of WV and was purchased at Roger Dean Chevrolet in Charleston. When you start reviewing some new hardware parts will stick out that don't match up to what you had. Some quick examples are sub-frame bolts due mainly to the machining to the ends which you see two of them when you pop the hood, and gas tank strap bolts! A good rule of thumb also is if it was a ground or ground related its clear (silver) zinc. I'm sure you have been around the horn on this stuff so again good luck and neat car. Thanks Everett, that would be great! I live about 3 miles from where your car was purchased. Roger Dean Chevrolet use to be downtown Charleston, WV on the corner of Washington Street and Broad street. ( Zone 40 - Dealer #135 ) They started out as a Mopar dealership. I don't know when they were started but I remember family members saying that they had done business with them in the 40's and forward. I know that they were still selling Chryslers in 1961 due to a story about a Dr. Golden and Roger Dean himself. Dr. Goldman liked for his cars to be gold in color, due to last name I suppose. Anyway, he wanted to purchase a new Chrysler 300G and Chrysler didn't offer gold paint that year. Mr. Dean ordered the 300G fully loaded, but only sprayed in primer. When the dealership took possession of the car, their body shop painted the color gold on it. ) The dealership was sold in 1971 and was then called Tag Galyan Chevrolet, Tag was a nickname given to Tinsley A. Galyean and several years later, I think in the mid 80's was renamed Team Chevrolet. About 10 years ago the property was leveled and the property donated by the family to the city for the purpose of building The Clay Center, a performance arts center. If you do a google search for Tag Galyean Chevrolet, you will see a few photos from the past. OK Charlie but you gotta add some too! 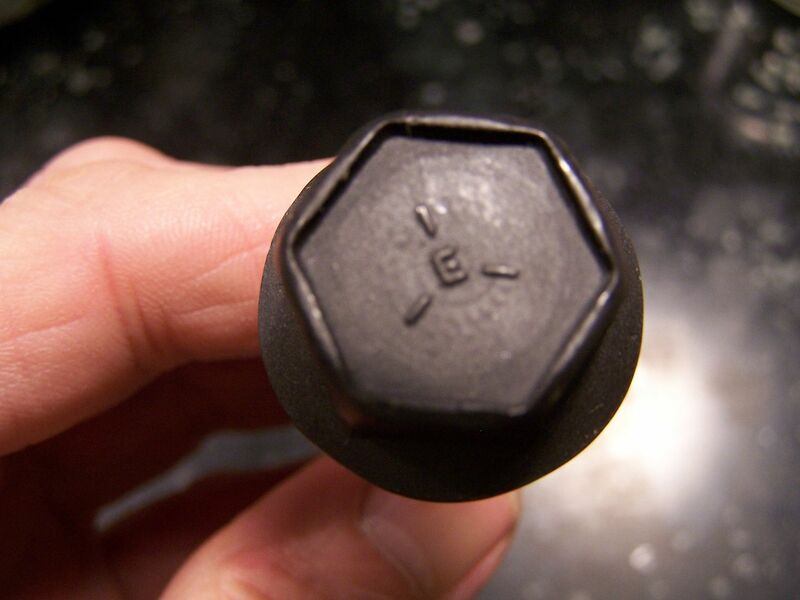 Here are pictures of what is commonly seen in 1st gen Camaro's sub-frame bolts made by RBW. 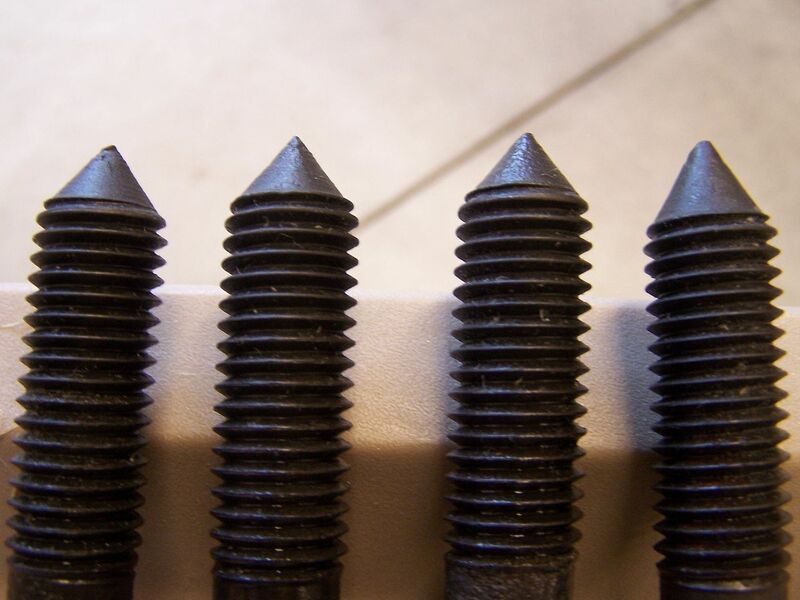 When the hood is open the top of two sub-frame bolts threaded ends are quite obvious and the originals sharp point is unique. 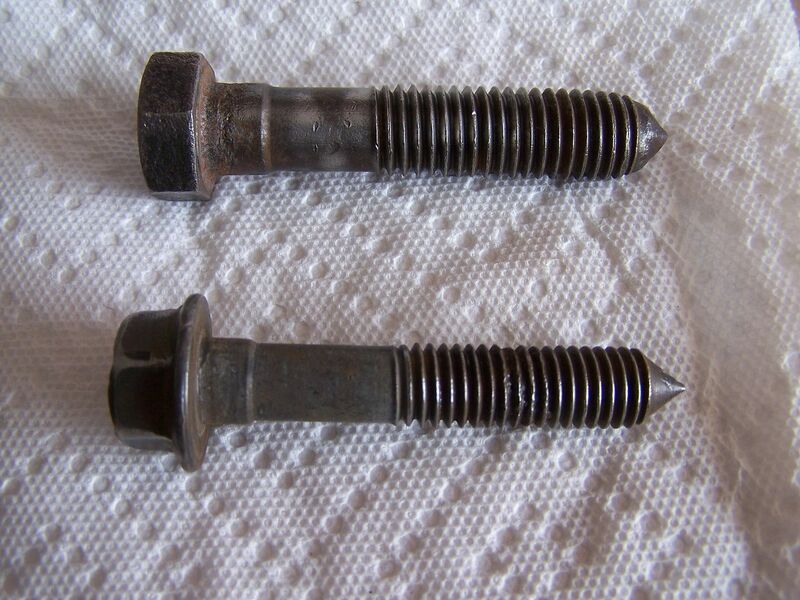 Right side bolt used for radiator support & AMK bolt exactly the same. Believe James had posted this picture which I saved a few years back if memory serves me but it shows a 67 or 68 sub-frame bolt/washer configuration. Note the small diameter washer is clear (silver) zinc. Chick, I think you mislabeled that 3rd pic ? Top bolt is sub-frame, bottom radiator support....? Yes Garth, the bottom bolt is for the radiator support and again the same Elco Industries "E" bolt is available thru AMK, i.e., same mfg. markings. 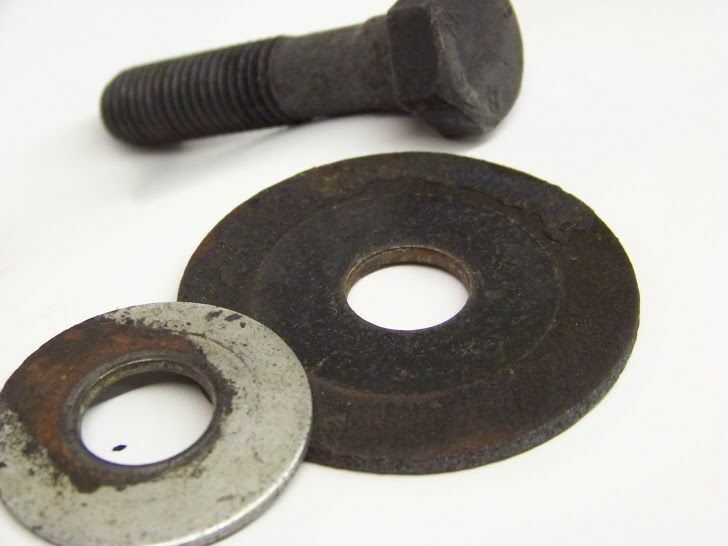 The other bolts that have a angled end that are incorrect on many restorations are the gas tank strap bolts. 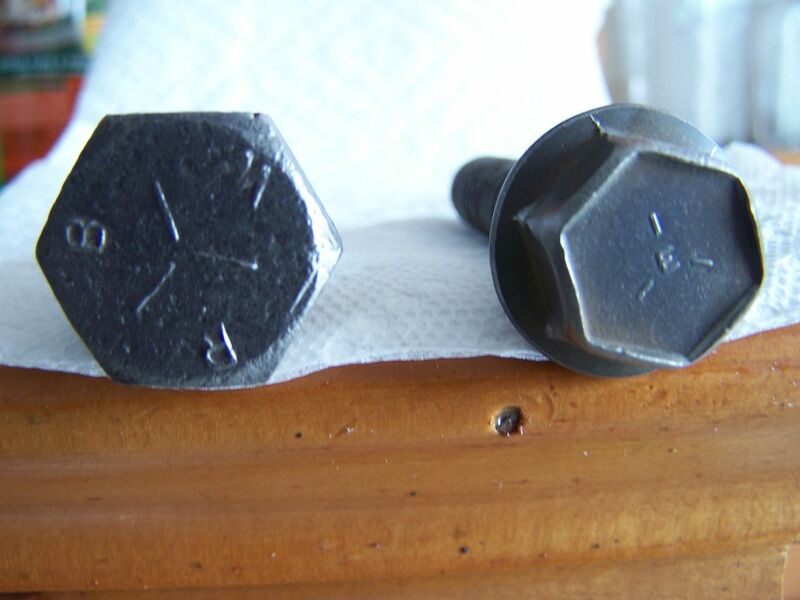 The two anchor bolts on the left from AMK are not technically correct compared to the two original RBW bolts on the right. If you have a friend with a lathe, chamfer the end to resemble originals and re-phosphate. Another thing that can help with finding stuff is a table of contents for a 68 Camaro. I got tired of trying to find stuff and went page by page to create a table of contents. Have a copy of this in front of my Assembly Instruction Manual. Hope it can help others! Also have a copy in my build thread.